Call waiting alerts agents when someone has called their direct line and gives them the option to address that call while they are already on another call. When call waiting is enabled and a new call comes in on an agent’s direct line, a call waiting beep will play for the agent and a prompt will appear to notify them of the new call. The agent may then choose to ignore the new call, put the current call on hold and answer the new call, or end the current call and answer the new call. Call waiting only applies to tracking numbers that are routed directly to an agent. The agent must have call waiting enabled in their user profile. The agent must be using the CallTrackingMetrics softphone. Click Edit next to the name of the agent you wish to enable call waiting for. Use the left-hand navigation or scroll down to the Agent Contact section. Click the toggle to enable Call Waiting. Return to Settings → Users and find the name of the agent in the user list. In the Agent Queue column, click User Queue for the agent. User the left-hand navigation or scroll down to the No Answer section. Click the toggle to disable Bypass Queue if no agents available. Leaving this option enabled would prevent the new incoming call from ringing through call waiting when the agent is already on a call. By default, calls to an agent will ring to them for 300 seconds and will hang up when the agent does not answer the call. 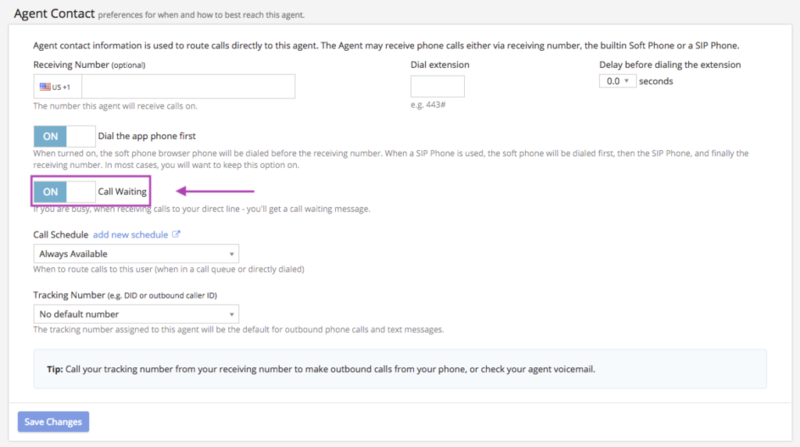 It is recommended to adjust these settings to route to another agent or to a voicemail box when using call waiting. Hold & Answer places the in-progress call on hold and answers the new incoming call. The in-progress call is placed on hold for anyone, so another agent would be able to continue that call by picking it up from the call log. 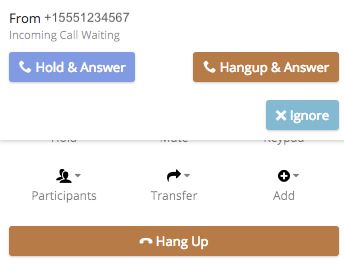 Hangup & Answer ends the in-progress call and answers the new incoming call. Ignore dismisses the new incoming call. The agent will continue with the in-progress call while the caller will be routed according to the no answer rules set in the user queue for that agent.